2013 | Killed in a Smiling Accident. Father Christmas arrives a week early for keen War Thunderers, with Patch 1.37 today bringing a veritable sack-load of new goodies: new planes, new maps, new flight models, DirectX 11 support, and perhaps most noticeably a major change in the research system. Previously you had a rank for each country, each plane had a rank, and achieving a new rank in an air force unlocked all the planes of that rank. This system had several good points, but a few disadvantages; progression could be a bit uneven as a new rank might not unlock planes of your preferred type (the US tree had a particularly bad Fighter Gap pre-v1.33 between the rank 13 P-51 Mustang and rank 18 F-80 Shooting Star, only partially filled by a couple of F8F Bearcat variants at ranks 15 and 16), or even any planes at all. 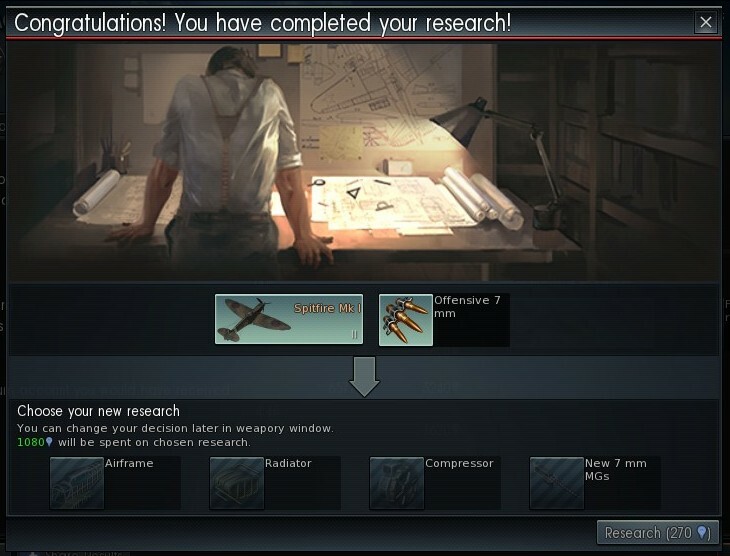 In 1.37 you pick one aircraft at a time to research per country, a little more like World of Tanks, but with some key differences. To unlock a new Era, you have to research a number of planes of the previous era. At the very left of the screen you can see “2/4” under the “II”: I’ve researched two Era II planes (the Hurricane Mk II and Spitfire Mk I), and need to research two more to move on to Era III, so I couldn’t immediately research the Era III Beaufighter Mk X after the Mk VIc. Premium planes count towards this number, though, so if I finish researching the Beaufighter VIc and buy a Boomerang Mk I or D.520, that will allow me to move on. To unlock a specific plane, you’ll need to have researched the previous plane in its line (connected via an arrow). In this example I haven’t started on the Wellington bombers yet, to research the Mk Ic/L, I’ll have to first research the Mk Ic. 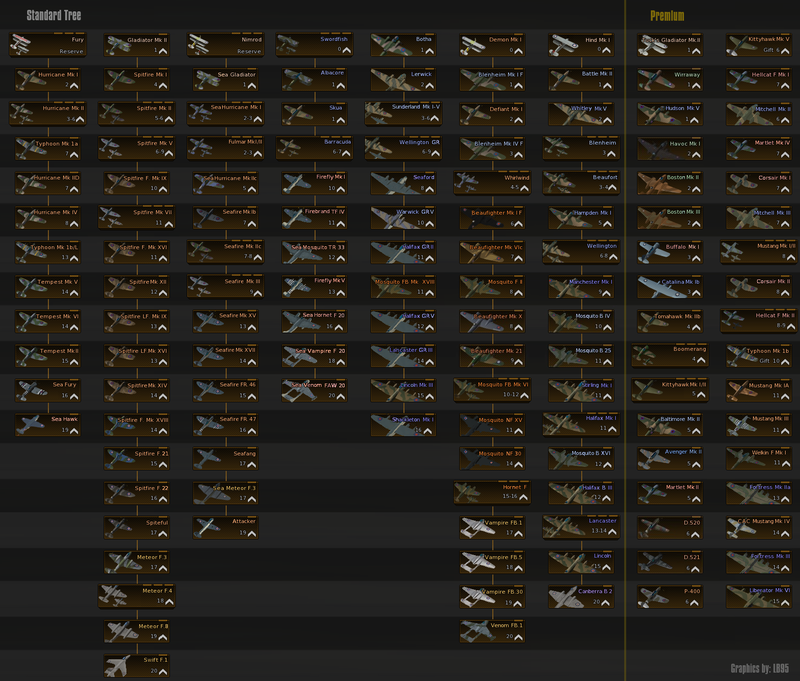 Some planes are “stacked”, like the Spitfire Mk II (clicking on it will reveal two variants, the Mk IIa and Mk IIb). 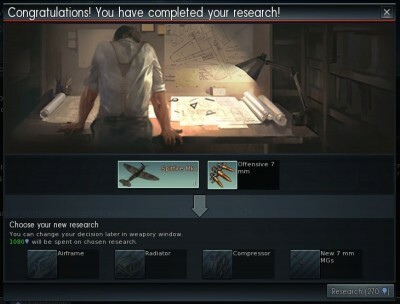 You need to research them separately, but you don’t need to unlock them all to progress to the next aircraft in the line (the Spitfire Mk V in this case). The general consensus seems to be that the new system may be slightly quicker for advancing all the way through one specific line of planes, but quite a bit slower for researching everything; a lot depends on the rate at which Research Points (“RP”, the replacement for XP in the new system) are awarded, which could well be tweaked a few times as the system beds in. There’s a Developer Diary that goes into a bit more detail, it looks like victory for a team will be a major factor in the number of RP received, which could be a positive factor in encouraging good teamwork, or equally terribly frustrating if you perform magnificently but lose a match due to a team full of buffoons. So much the same as ever, really! This entry was posted in war thunder, zoso on December 18, 2013 by Zoso. We’ll have to destroy them ship to ship. Get the crews to their fighters. When it was announced that Star Wars: The Old Republic would be getting free-flight PvP space combat, my interest was piqued; being a fan of the old X-Wing series, and having spent most of my brief Star Wars Galaxies tenure jumping to lightspeed, I thought I might as well resubscribe to be first in line for starfighter access. And for free hats. Mostly the hats, to tell the truth. I’ve only dabbled a little in space fighting since the update arrived, and I’m not sure I’ll be throwing myself into it in a big way. It all seems nice enough, you have a variety of ships, can tinker with the crew and the fittings, level up various aspects of their abilities, but the actual flying-around-and-shooting side hasn’t really grabbed me. I think I’ve been spoiled by War Thunder, which uses a “virtual instructor” so all you have to do is point the mouse in the vague direction you want to fly, and the instructor accordingly adjusts the elevator, rudder, ailerons, elevons, upperons, downerons and any other control surfaces that happen to be kicking around; once you’re pointing the right way, the camera aligns, and you’re flying straight and level. It’s a brilliantly intuitive and easy system; I was showing the game to Van Hemlock, lined him up a Spitfire for a test flight, and with minimal instruction (“press shift to go fast!”) he took off, flew around, shot up a practise target and landed, without crashing. Galactic Starfighter, like a lot of other flying/space combat games, uses more of a mouse-as-joystick approach: move the mouse left and your ship goes left until you move the mouse back to the middle of the screen, a scheme that needs a bit more practise to get to grips with. Needing practise, it would be a nice if you were thrown into battle with fellow novices so you could all bumble around together, with your wingman struggling to put his starfighter into gear while you accidentally turn on the windscreen wipers instead of firing your blasters. With a phased approach to release (subscribers having access now, ‘preferred’ players getting access on January 14th and completely free access from February 4th), it seems that the pool of potential pilots is too small for any matchmaking niceties like taking account of player performance or ship upgrades, and most rounds I’ve played so far have been dramatic mismatches differing only in whether the Imperial forces disconsolately hang around one of the three control points for an inevitable but prolonged loss, or just get camped on their spawn point. At this point I could knuckle down and jolly well harden the ruddy heck up, keep on plugging away and gradually improving, or… not bother. And with War Thunder and World of Warplanes available to scratch the dogfighting itch, not to mention space games like Star Conflict if gravity and an atmosphere is too much of a drag, Option 2 looks rather tempting. Though the space combat itself hasn’t been terribly inspiring so far, Galactic Starfighter has got me back into SWTOR more generally. I’ve been on an MMO-break for a fair while, but seeing as I’d subscribed again I thought I might as well have a look at the expansion, Rise of the Hutt Cartel, that added a new planet and raised the level cap. It was rather fun to dust off my Imperial Agent and chat to the old crew again, but upon landing and actually getting into combat it was the familiar old problem of having four hotbars of random icons to get to grips with again. 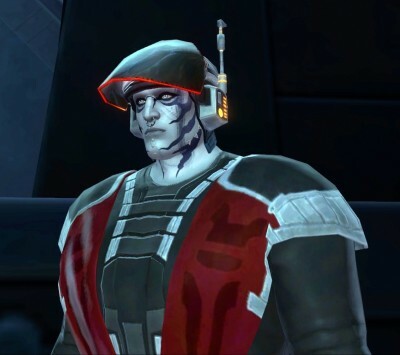 Fortuitously the FRR posse were just piling in, a fine opportunity to roll a new character and get back into the swing of things, and it’s been most splendid rampaging around the place and discussing the quantum state of Schrödinger’s Black Talon Captain with others. I may still try the odd starfighter flight, then, as a bit of downtime between quests and flashpoints; perhaps once preferred players have access there’ll be a brief flurry of newcomers I might have half a chance against, while the even-more-seasoned-by-then veterans enjoy a Happy Time in a potentially extreme case of free(ish) players being content for subscribers, unless the matchmaking system keeps them apart. As part of the wider whole of SWTOR it’s nice to have options alongside the main story, the PvE on-rails flying the game launched with, conventional PvP battlegrounds, flashpoints, operations etc., but I’m not sure Galactic Starfighter is really strong enough to pull people into the game by itself, especially with dedicated projects like Elite: Dangerous and Star Citizen inching towards playability. Still, the beauty of free-to-play is that you give it a try yourself from February without any financial outlay. 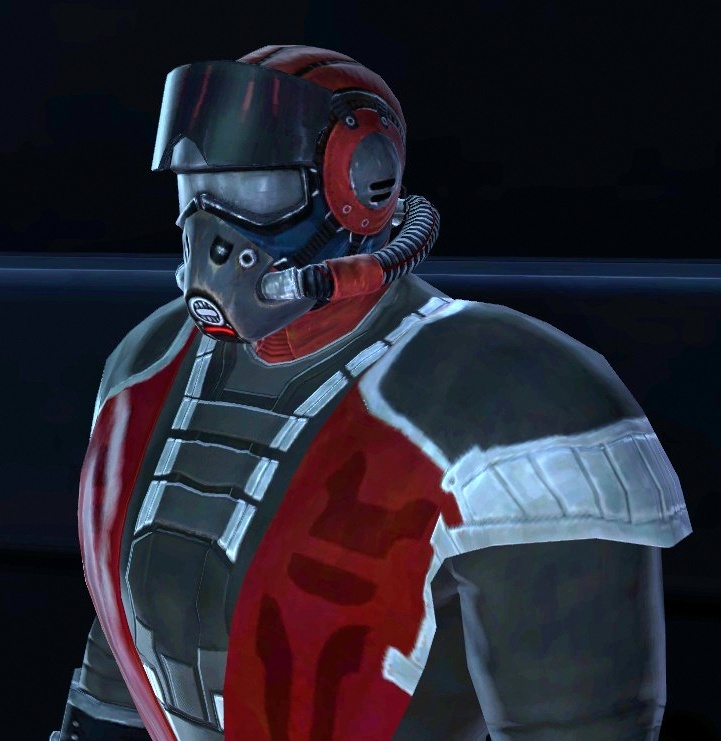 This entry was posted in swtor, zoso on December 16, 2013 by Zoso. Hat News Now Today Returns! A good start; a sound base of flying helmet (textbook), a dash of Stormtrooper, a pinch of Cold War gasmask and just a soupçon of gimp. Equally at home in the cockpit of an Imperial starfighter during a fierce dogfight or hanging around the fleet station bar trying to work out where to pour a drink. What is it about the Republic and orange? Really, guys, 1993 called, it wants its bold colour blocking back. Oh, hang on, not 1993, we’re in… what… 3953 BBY? So… 3973 called? And it wants to know how it’s possible to use a chronological system based on the Battle of Yavin that won’t happen for thousands of years. And also how time travelling phones work. Does my face look bovvered? Does it? Oh, it does. Yes, well, so would yours under this monstrous carbuncle. The Republic don’t do terribly well out of the Starfighter headgear; about the only thing you can say in favour of this one is that the peak/visor thing doubles as a handy can opener, so if your starship crashes on a deserted planet you’ll be able to get into the tinned food in the emergency supply kit. 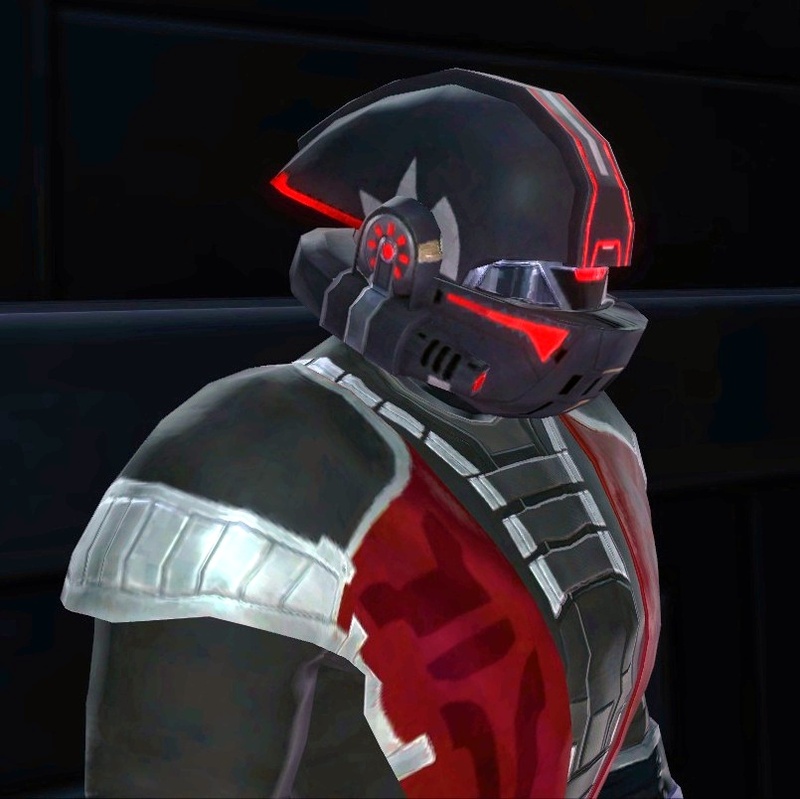 The second Imperial helmet, and my personal favourite. 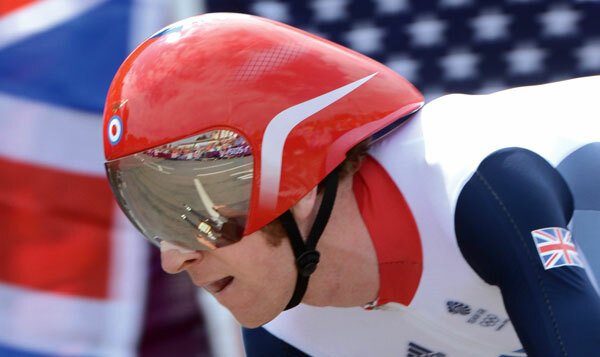 Hints of the original TIE pilot’s helmet (via some timey-wimey inspiration, as previously mentioned they won’t be around for a few thousand years), but with the help of Darth Bradley Wiggins it offers an optimum aerodynamic profile when riding a speeder. This entry was posted in hat news now today, zoso on December 14, 2013 by Zoso. News of the impending closure of Warhammer Online came as a surprise to some, in much the same way that people are surprised when they read the obituary of a celebrity they thought had died years ago. The last major patch had been game update 1.4.0 in 2010, other than the announcement of an arena-ish Play4Free spin-off, Wrath of Heroes, it had been pottering along quietly for the past few years, so it’s not really surprising it had dropped off the radar. It was a different story before release, publicity for WAR was swirling around at the time Melmoth & I started this whole blogging business putting it quite firmly on the Anticipated Future MMOG Radar; my fourth ever blog post, from 2006, linked to a Slashdot WAR Q&A. The early buzz was good, but over time there were less positive signs; release date slipping to the right, content being cut from the initial release (four classes, four of the six capital cities), nothing particularly shocking for a game (or indeed most large IT projects) as The Crunch sets in, but not ideal, especially with a World of Warcraft expansion in the offing. Casting back through the blog I’d forgotten the landscape WAR launched in; around 2005/6 the rising tide of World of Warcraft looked like it might lift all MMOG boats into the mainstream, an enticing prospect for Games Workshop and EA, but by 2008 it seemed fairly clear that wasn’t the case, nothing was getting near WoW, especially in the west. Except in rare cases (like EVE, pre-dating WoW) it didn’t seem possible to gradually build a player base, subscriber numbers for new games peaked at launch then rapidly fell away. Personally, after drifting away from City of Heroes and WoW, I’d been pinging between newly launching MMOs like DDO, LotRO, Tabula Rasa, Pirates of the Burning Sea, Hellgate: London, Age of Conan, playing a month or two at most, and had a bit of a breakdown at the prospect of killing 10 more things. Warhammer Online hooked me in for a good old run, though, getting up to the level cap and doing a spot of end-game city raiding on the Order side. There was a lot to like; the visual style, public quests, poking around zones, the Tome of Knowledge, besieging and defending keeps and castles… Course there were rough edges too, some that got ironed out fairly quickly, others that are probably still kicking around in tier 4 public quests. Some elements didn’t quite work out, like those good old Kill Collectors; Barnett really nailed a frustration with a game mechanic (I hadn’t realised quite how much my History Repeating post echoes it until looking at the two together), but there were still plenty of bog standard “Kill 10 Things” quests in the game, available resources couldn’t quite support the ambition (see also: P. Molyneux). A long term PvP-centric endgame is also somewhat problematic for new/more casual players if characters keep getting more powerful with time and success. Player numbers dropped (not least when Wrath of the Lich King was released shortly after), the inevitable server merges followed, I drifted off myself on another MMO-break. I drifted back a while later and rampaged around on the Destruction side of things with Van Hemlock’s Hipster Battalion, hitting the level cap again, pushing WAR up to second place on both my Total Subscribed Time List and Most Fondly Remembered MMO List after City of Heroes (*sniff*), so far those are the only two games where I’ve hit the level cap with multiple characters. The 1.4.0 patch hinted at the possibility of a move to a free to play model, with “booster packs” available in the EA store; other major titles like Dungeons and Dragons Online and Lord of the Rings Online seemed to be doing well after conversion, but it never transpired, though it turns out the work had been done behind the scenes if EA, Bioware, Mythic, Games Workshop or some random combination of the four had wanted to go down that path. Perhaps closure was inevitable from that point; the end of the Games Workshop license deal is being cited as the reason the game is closing in December, with WAR not turning out to be a money-printing bonanza I guess neither side had much appetite to renegotiate the license for a different revenue model, especially as with lawyers involved the costs could easily spiral into the realms of “the price of a couple of Space Marine squads”. All right, that’s just silly. One Space Marine squad. Towards the end of last year SEGA and Creative Assembly announced a partnership with Games Workshop for a “multi-title licensing deal” … “to create videogames based in the Warhammer universe of fantasy battles” … “scheduled to launch from beyond 2013”, prompting some speculation over the future of Warhammer Online amongst those who remembered it. 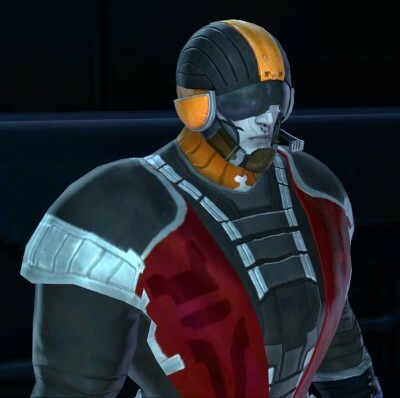 Not long after that key WAR figures either jumped or were pushed, including the lead developer and community manager, the Wrath of Heroes beta closed down, and the only news on the WAR homepage was the withdrawal of six month subscriptions. Some speculated that was because the game wouldn’t be around in six months, suspicions confirmed three months later. This entry was posted in war, zoso on October 15, 2013 by Zoso. 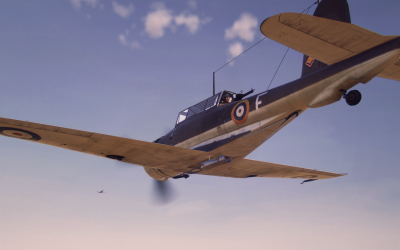 Wargaming have gone some way towards atoning for past transgressions by adding British aircraft in the 0.5.3 update to World of Warplanes, so I thought it would be rude not to take a look at least. 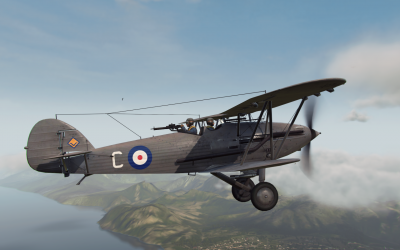 As per most of the other tech trees there’s a decent core of “proper” World War II aircraft in the mid-tiers with more unusual stuff before and after; a good chunk of the the fighter branch is taken up by key Spitfire marks (I, V, IX and XIV) followed by a couple of Supermarine jets, the heavy fighter branch features the Beaufighter (albeit with stupid Mk V Boulton Paul experimental turret option), Mosquito and Hornet before wandering into the realms of prototypes. No sign of the Hurricane, presumably to be part of a future Hawker branch with the Typhoon, Tempest and Sea Fury. The early part of the fighter tree is padded out with some more unusual stuff like this Tier IV Bristol 146, based on a single prototype. I think the pilot might be David Niven, though he looks a bit grumpy about something; probably being stuck in a plane that even Hurricane pilots think is for remtards on free dinners and having to grind through the rest of Tier IV to get a ruddy Spitfire. The heavy fighter line starts at Tier II with the Hawker Demon, a fighter version of the Hart inter-war bomber, one of the last RAF biplanes, still in limited service in 1939. The Tier III Blackburn Skua, an early war carrier aircraft somewhat hamstrung by having to fulfil both fighter and dive bomber roles. The model includes the swing bomb-crutch designed to throw the bomb clear of the propeller, though unfortunately it doesn’t animate on bomb release. There’ve been a few other changes since I last tried the World of Warplanes beta. Aircraft handling in general seems a bit smoother; aircraft camouflage now works in the same way as World of Tanks, with separate summer/winter/desert/marine paint schemes offering slight concealment benefits; crew skills have been implemented, again very similar to World of Tanks. Overall, though, despite the improvements the general conclusions of my War Thunder vs World of Warplanes post still hold, I prefer the flying and damage modelling in War Thunder, and the different modes and battle types keep things fresh; War Thunder events even offer no-respawn Arcade action, if garage battles were a complete dealbreaker. 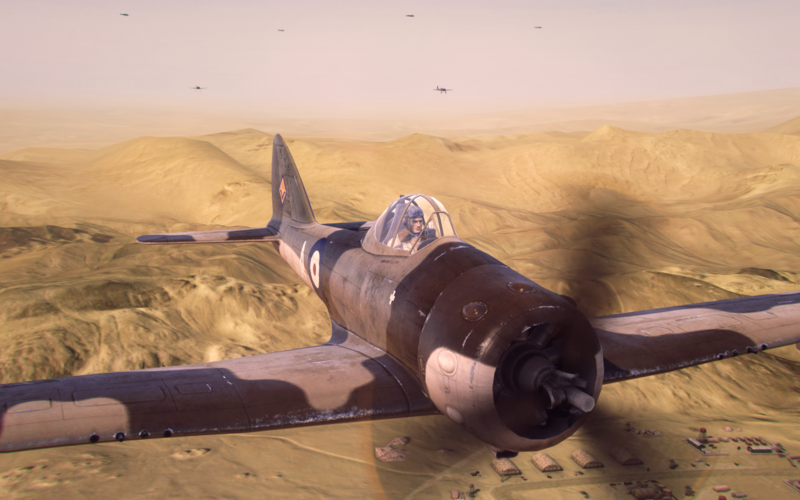 World of Warplanes is fun for a drop-in blast, though, and at least you can fly Spitfires now. This entry was posted in world of warplanes, zoso on October 9, 2013 by Zoso.